Yvonne Patterson is shown here performing in front of a large audience at a recent Home Show; she uses her toucans in Wings of Love bird shows in the Midwest. 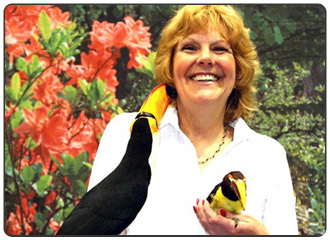 Yvonne has kept toucans for over 17 years with psittacines, finches, pollinators and raptors in a large sunroom on the back of her home. The toucans names are Tiki Toco Toucan, and the green aracari is Pinocchio, boith of which I acquired from Emerald Forest Bird Gardens. In the graphic with the black background, Tiki is giving Yvonne some ‘love’ as he gently rubs his beak across her arm. He wowed audiences at a recent Home & Garden Show when he gave his owner the loving gesture in 15 shows within a 4-day period. Yes – that is a lot of 40-minute shows but great exposure; the birds and Yvonne took an entire week off afterwards. In the colorful backdrop graphic, Yvonne describes toucans’ captive and wild behaviors, explains uses of their beaks, necessity of feather colors, and other interesting information. Yvonne shares with audiences that Pinocchio had caught and killed two finches with her beak (she did not allow her eat the birds) and even though she was very upset about it, she couldn’t be upset at Pinocchio because that was the bird’s instinct acting out. In other words she points out that even though animals are born in captivity, they still have wild behaviors. Yvonne tells interested future toucan owners that spending a little extra on a hand-raised bird makes an incredible difference as it is difficult to tame a toucan that’s wild.